It’s Hatch Chile season! We love this time of year because we get to indulge in these uniquely delicious chiles, grown in Hatch Valley, New Mexico. They add a fantastic kick to any recipe and here is a great one you can have for breakfast from Melissa’s Hatch Chile Cookbook. Prepare the farro according to the package instructions. Set aside to cool briefly. Place the potatoes in a pot and cover with cold water. Add salt to taste, bring to a boil, and cook until the potatoes are fork-tender, about 10 minutes. Drain the potatoes and transfer them to a large bowl. Mash the potatoes and set aside to cool briefly. Heat 2 tablespoons of the olive oil and 2 tablespoons of the butter in a saute pan. Add the onions, season with salt and pepper, and saute until they are softened and lightly browned, 5-7 minutes. Add the onions to the potatoes. Heat the remaining 2 tablespoons of olive oil and 2 tablespoons of butter in the saute pan. Add the Hatch Chiles, mushrooms, garlic, smoked paprika, Italian seasoning, and Hatch Chile powder. Cook the mixture until the mushrooms are tender, about 5 minutes, and then add the sherry. Saute until most of the moisture is evaporated. Add to the potatoes. Add the chives, breadcrumbs, cheese, eggs, and cooked farro to the potato mixture. Use your hands to mix until thoroughly combined. Form into 8-10 patties about 1/4-inch thick. Wipe the saute pan clean, set it over medium heat, add canola oil to a depth of about 1/2 inch, and heat until the oil shimmers. Fry the patties until golden brown on each side, turning once, and 3 minutes per side. Hatch Chiles are coming to our stores this week. Follow us on social media (links below) to keep up to date with all things Hatch! Our first Hatch Chile Roast will be this weekend, on Sunday, August 13th at our Castro store. We will be having Hatch Chile Roast events throughout August and September. Check out the schedule and find out how to pre-order here. Be sure to share your favorite Hatch Chiles recipes with us in the comments below! 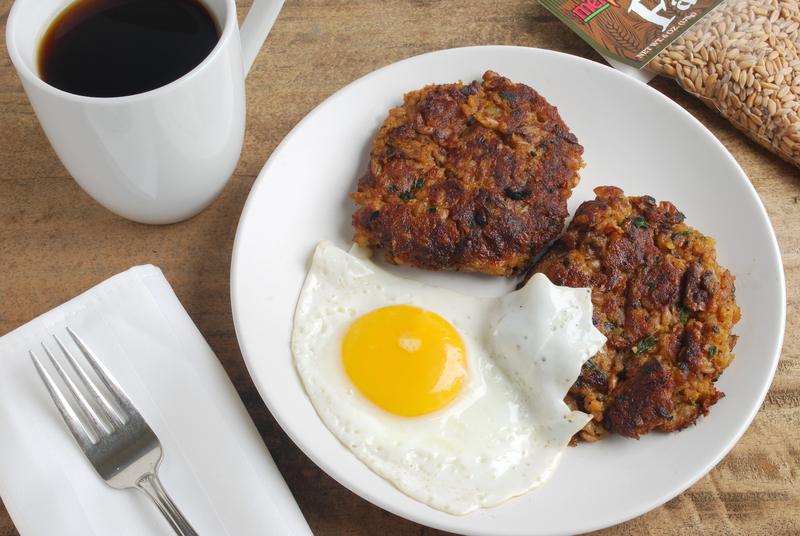 Share your Hatch and Farro Breakfast Patties photos with us by posting onto our Facebook page or using the hashtag #CookingWithMollies on Instagram or Twitter.